(Newser) – In the wake of its ratings debut stunner—and congratulatory call from President Trump—the new Roseanne show stirred up controversy this week with a joke about TV shows focused on black and Asian characters, USA Today reports. 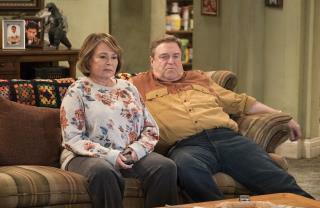 In a recent episode, Roseanne Barr and John Goodman wake up on the couch at night: "It's 11pm," Roseanne says. "We slept from Wheel [of Fortune] to Kimmel." Goodman's character Dan Conner responds with, "We missed all the shows about black and Asian families," an apparent jab at ABC shows Black-ish and Fresh Off the Boat. Then Roseanne quips, "They're just like us. There, now you're all caught up." Not everyone let the moment go by with a chuckle. "At the very least, it's reductive and belittling, as if to say those shows are nothing more than 'Black' and 'Asian' in their existence," writes Taiwanese-American actor/writer Kelvin Yu in one of a series of tweets. "What exactly is the punchline here? ... It's a familiarity and comfort with the culture of objectifying and demeaning people of color." But co-showrunner Bruce Helford stood up for Roseanne's remark: "We were commenting on the fact that all sitcoms really want everybody to feel included of all diversities and it's kind of a funny thing," he tells the Hollywood Reporter. "And I don't think anybody wants to be excluded because it's [a show about] either a black family or an Asian-American family." Take another shot at it and express yourself good. These are not black & Asian families when it's going to be some kind of "joke." Holy smokes, why are libs so uptight? It is a joke, stop crying. People, grow a spine. My gosh, I can't believe how people are so weak and get offended by words like little kids. Grow up.